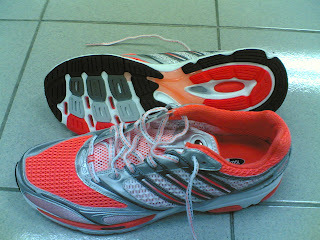 Adidas gave out shoes for those who have websites or blogs on running . Mr Krishnan was very kind to let me check out a few shoes . He let me try 2 different pairs on each leg and he said that this is the best way to try out shoes . This is the first time I try out shoes using this method . It is a great method . There were about 4 different types of shoes to choose from and in the end I felt very comfortable and confident with Adidas Boston and here are the pictures above . Reports of the shoes will be out within a month . Hey, it's Frank here. I just love the colour of your shoes. Yup , I love it too from the 1st time I set eyes on it . 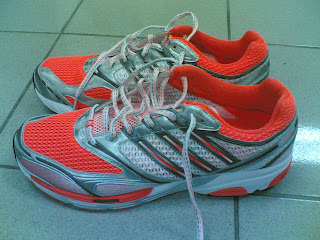 Krishnan told me not to be influence by the color but choose a shoe that i feel comfortable with . 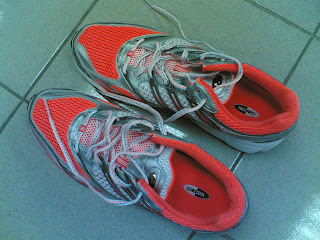 So it was a nice colour and also felt good while running .